The 1967 Mustang Sports Sprint was an entry level sport options package which included hood vents, recessed turn signals, white wall tires, full wheel covers, bright metal rocker panel moldings, chrome air cleaner, and vinyl covered shift handle if an automatic transmission was ordered. Early in 1967 the Sport Sprint package was only offered on the hardtop body style, but by June 1967 the convertible was included. Often times these Mustangs were ordered in special colors such as Springtime Yellow or Dusk Rose (Pink), and most could include a decklid mounted luggage rack at a reduced price. Ford offered a set of promotional ads for this special model, often calling it a limited edition and included it as part of the 3rd birthday celebration of Mustang. Teri Garcia owns this Dusk Rose pink, 1967, 200 Sprint, Mustang hardtop which was our Attitude Of The Week for the week starting January 31st, 2010. 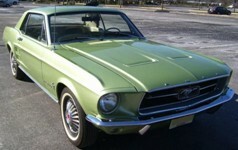 Teri tells us more: My Mom and Dad bought me my 1967 Mustang in 1995 (my senior year of high school). When I got my Mustang it was Red. It is a 6-cylinder 200 sport sprint with a 3 speed on the floor. We did not know what we had until my brother went to put a new stereo in the car and saw the floor boards were pink. We ran the codes and sure enough it was originally Dusk Rose. My brother really had to twist my arm to restore it back to the original color. I always wanted a red Mustang. In 2002, I finally had it restore back to it's original color. It was done just in time for my wedding. In 2007 we had the engine rebuilt, engine compartment redone, and a good bit of the suspension redone. Restoring this Mustang back to the original color was the best thing we ever did. People are so curious about it. We have so much fun meeting and talking to people about our Mustang. We have won many awards. We have two 2nd place awards and one 3rd place from the All Ford Nationals in Carlisle, Pennsylvania. Lime Gold 1967 Mustang Sprint hardtop with a 120hp (at 4400rpm), 200 cubic inch, inline 6 cylinder engine. The 1967 Sprint Sport package which came with hood vents, recessed turn signals, white wall tires, full wheel covers, bright metal rocker panel moldings, chrome air cleaner, and vinyl covered shift handle if an automatic transmission was ordered. Lime Gold 1967 Mustang Sprint 200 "A" hardtop with automatic transmission, full wheel covers, metal rocker panels, vented louvered hood, and a 200 cubic inch, 120hp (at 4400rpm), 1 barrel, inline 6 cylinder engine.